Bonnette graduated from Whitman College in 2018 with a degree in Politics & French. 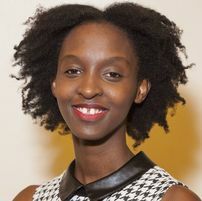 During her time at Whitman, she was an International Orientation Assistant for three consecutive years, an intern for the Study Off-Campus Office and was elected the President of the African Student Association. During the summer of 2016, she spent her summer interning at Congresswoman Betty McCollum's office in Washington D.C. In 2017, she spent her spring semester with the Wilson Center in Washington, D.C. and secured a coveted summer internship with the Ministry of Foreign Affairs of Rwanda. Bonnette’s family survived many attacks during the 1994 genocide, but she ultimately lost her father in the conflict. Her mother singlehandedly raised her and her younger brother, and in high school Bonnette distinguished herself by holding countless leadership positions and graduating with honors. She aspires to be a legislator and work on policies that foster excellence in education, environmental protection, fiscal responsibility, and robust foreign policy. But most of all, Bonnette hopes to mentor other young Rwandan girls and foster future women leaders who will help to grow Rwanda’s economy.